Finally, after 8 weeks of hard training, last Sunday was the big day for Ben Philips. 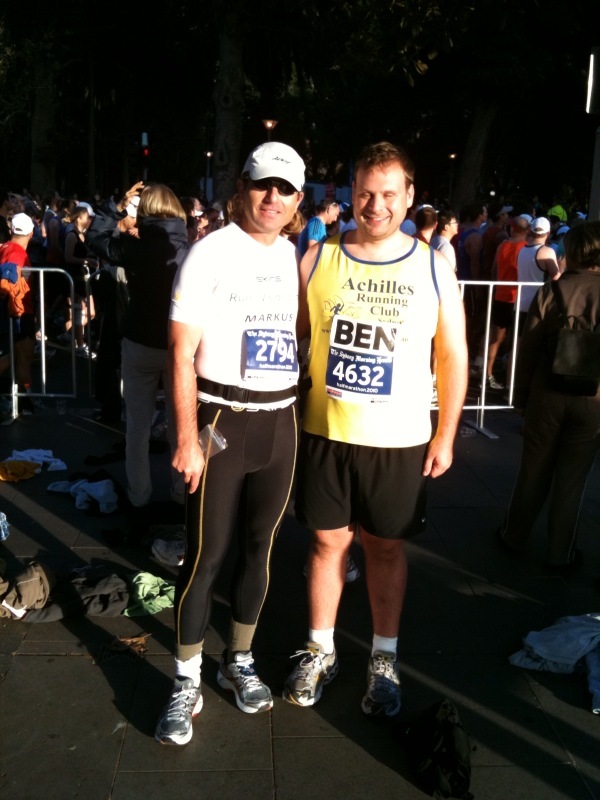 When I started running with Ben, he was able to run one slow round in Centennial Park before being out of breath. 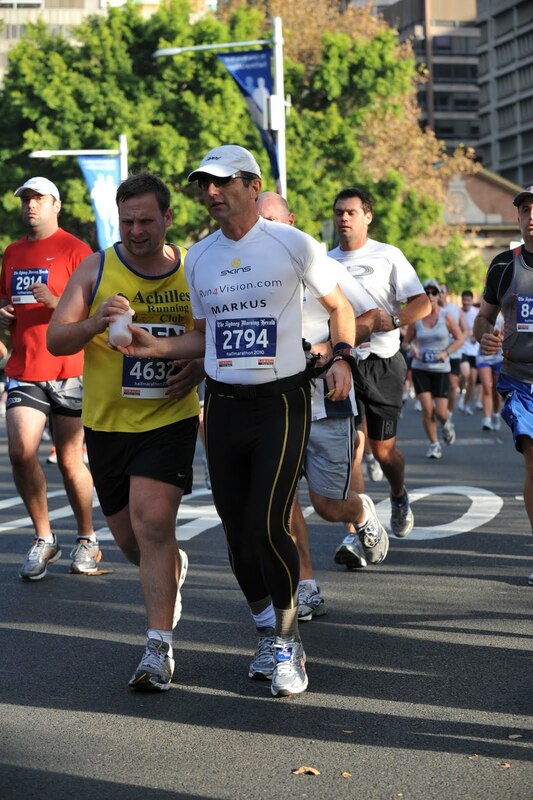 Yesterday he finished his first 1/2 marathon in a stellar 131 min – prove again that hard work and determination pays off. Well done Ben! It was a fresh but beautiful morning when we both lined up at the start next to St. Mary’s Cathedral. Ben was understandably nervous, not sure if he is up to the distance and wondering if all the training was enough. 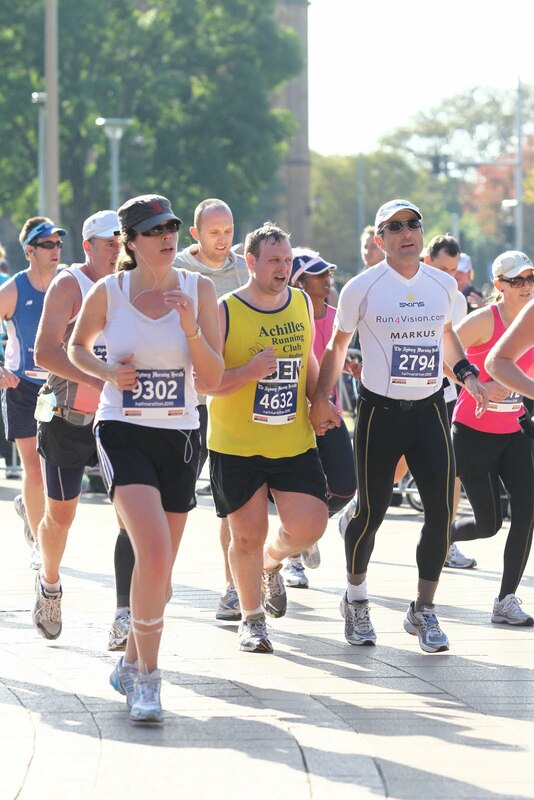 We waited a few minutes after the gun when off, to get a few of the 10’000 runners out of our way. Once we started running we soon found our pace and thanks to the help of Doug and Ellis, who helped us clearing the way in front of us, we started overtaking slower runners. Ben started to enjoy the run and got more and more confident to a point were I had to slow him down a bit, knowing that the hard part is yet to come. We finished the first of two rounds in 66 min, well under the 75 min cut-off time, a time which was a daunting task to run a few weeks ago. 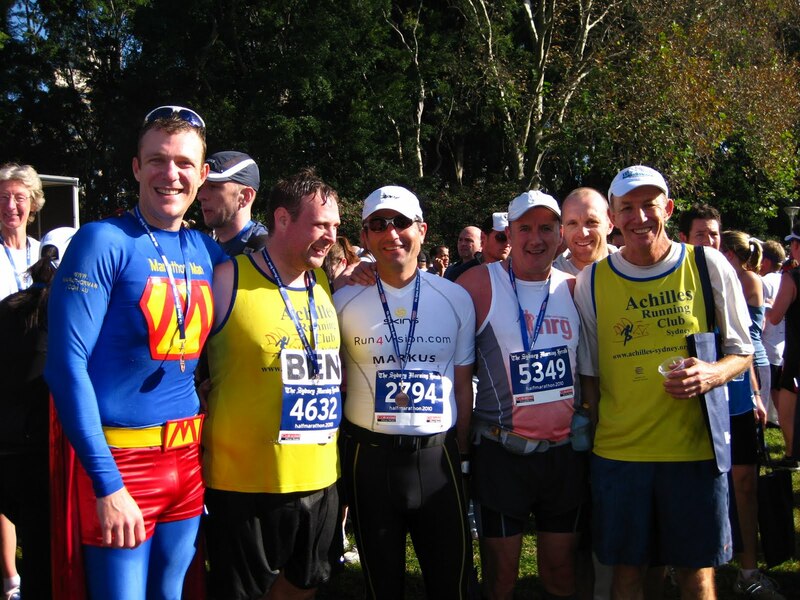 During the last half of the second round, especially going up Hunter Street a second time, the hard going got tougher and it was the first time Ben had to walk a few meters – getting his breath back. 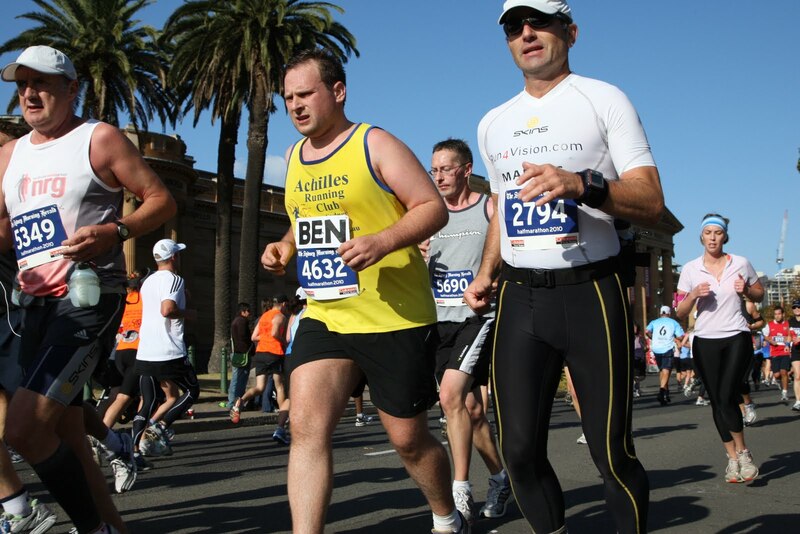 But true to the saying, when it gets hard the tough get going, Ben headed into the last few km with his head down, struggling around Maquarie’s chair, fighting hard to keep on his legs with every step, but never giving up. The last 1000 meters were helped by the great support of all the spectators and in a final sprint we crossed that finish, exhilarated and happy. 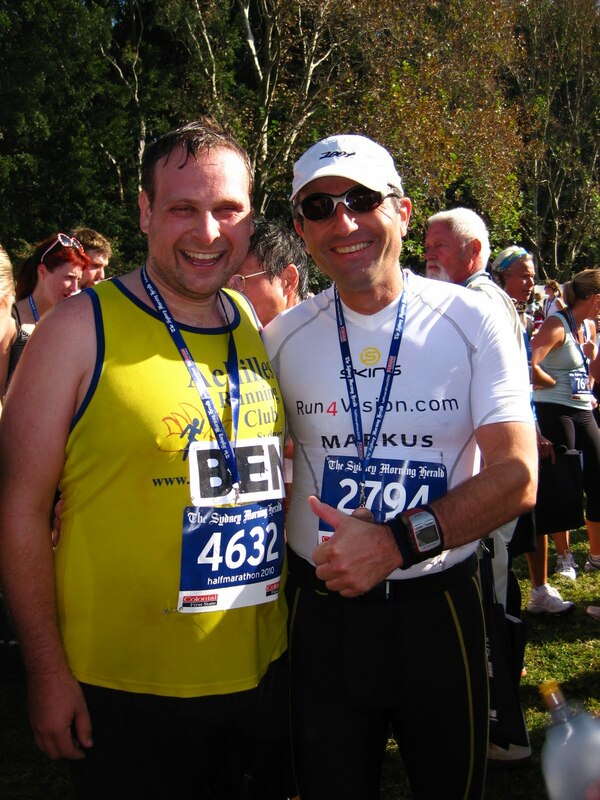 I am very privileged to have been able to share this journey with Ben, it not only helped preparing me for the big race in 2 weeks time when I will be running 89 km with blind Francois but more importantly it started a friend ship which I hope will bring us many more days of fun and races to run. Congratulations Ben to a job well done!